Dermatology performs various surgical procedures. 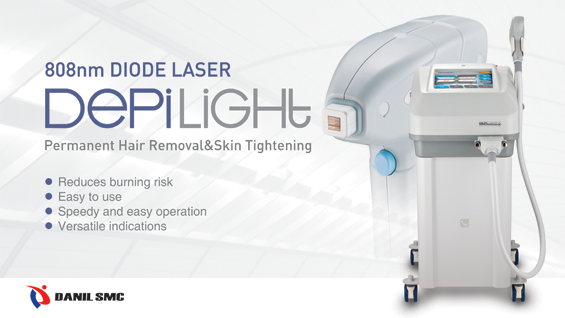 However, the number of surgical procedures is decreasing relative to the increased popularity of noninvasive procedures with recent introduction of lasers. The information on dermatological surgery seems lacking accordingly. This article is a dermatological case series by Professor Kim Ilhwan at the Department of Dermatology in Korea University Ansan Hospital. Prof. Kim will present patients he had treated in the past, with detailed explanations on the diagnoses, examinations and the course of treatments as well as vivid clinical photographs. He will also present analyses about the diseases and treatments. This dermatological case study by Prof. Kim Il-Hwan will be of help for treatment of various diseases in the clinical setting. 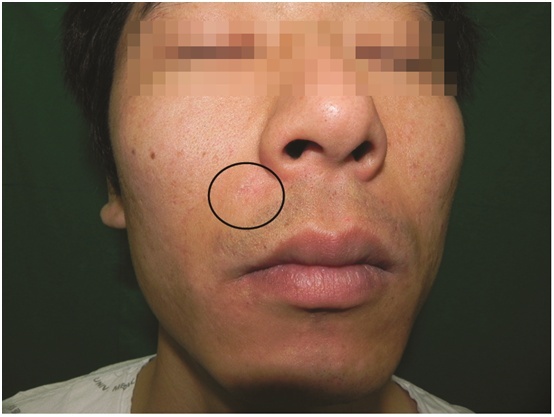 ■ Chief complaint: He visited the hospital for a cystic subcutaneous nodule palpated at the right nasolabial fold for 10 days before the visit. ■ Past medical history and family history: The lesion was resected at private clinics for the last 2 years but recurred 3 times. The symptom reappeared without any specific triggering factor. 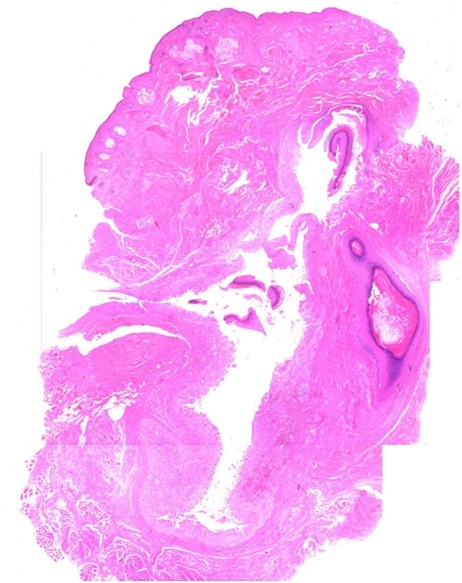 ■ Surgical findings: Excisional biopsy was performed and the well-defined fibrous cyst was completely dissected (Figure 2). ■ Histology findings: The epidermal cyst had layered epithelial cells containing a granular layer and inside the cyst were keratin contents and some of fragmented remaining wall (Figure 3). 1. Diagnosis: Commonly diagnosed by confirming an opening of the cyst or the characteristic odor and confirming mushy palpation. When the opening is hard to find or it is necessary to confirm whether it’s a cyst, the opening can be found by injecting normal saline with a syringe and the lesion can be diagnosed as a cyst when nucleated keratinocytes and wavy keratin materials are detected by Wright-Giemsa stain of the extracted and smeared content. 2. Necessity of examination: Generally unnecessary, although bacterial culture is needed in case of infection without response to antibiotics. Ultrasonography, CT or MRI can be performed for imaging when the lesion is large and deep. 3. Histology findings: The wall of the epidermal cyst is consisted of layered epithelial cells containing a granular layer and inside the cyst are keratin contents. Older lesions become calcified, and ruptured lesion often presents foreign body granuloma reaction. 1) Size ≥2㎝, past history of rupture or squeeze or recurrence after mini-incision technique – the lesion including the cyst wall is removed completely by wide excision. 2) Size ≤1㎝ or lesion on the face – mini-incision technique is performed. 3) In the presence of active inflammation – the inflammation is treated first. 1. Wide excision: As a standard treatment, the cyst is completely removed with the surrounding tissue after fusiform incision and subdermis dissection. This method is used mostly in areas other than the face as novices take much time for the dissection and leave a large scar from the incision. 2. Mini-incision and punch excision: 2-3㎜ incision or a disposable biopsy punch is used to cut a hole, through which the content of a cyst is squeezed out with suction, dissected pocket is carefully removed. This method reduces hemorrhage, recovery time and scar formation but requires extensive hands-on experiences due to a higher risk of recurrence after incomplete removal. The author often uses a combination of both wide excision and mini-incision technique. More specifically, an incision is made minimally according to the size of a cyst so as to reduce scar formation, and an opening for removal of the content is made to reduce dissection. 3. 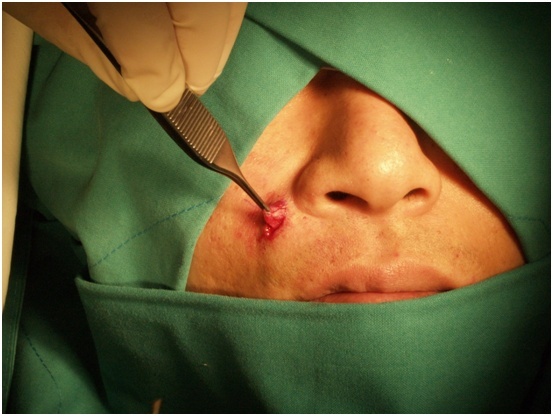 Surgical techniques required for complete removal: In order to obtain visibility during the surgery, bleeding should be minimized and hemostasis should be applied at the right time. 1% dental lidocaine containing epinephrine should be used for local anesthesia before the surgery, and suction should be applied during the surgery to find accurate bleeding point. Hemostasis is available mostly by electrocautery. Blade No. 15 is used, instead of scissors, for precise dissection. 1. Treatment of inflammatory and infectious cysts: Inflammation or infection should be treated beforehand for easier rupture of the lesion, making the cyst wall more definite and enabling complete removal of the cyst. An inflammatory and swollen cyst with pain can rupture easily while attempting to remove it before treating the inflammation, and if only incision and drainage are performed, the remaining cyst wall may cause recurrence. In this case, 10-20㎎/㎖ of triamcinolone can be injected to the surrounding tissues, which can calm the inflammation within several days allowing easier removal. Infection is generally uncommon and is mostly a secondary inflammatory response to a foreign body when the cyst wall is damaged and the keratin content is leaked to the surrounding tissues. 2. Treatment of a ruptured cyst and cases of rupture during removal: A large cyst ruptures easily during a surgery if the incision line is small. Once ruptured, thicker dissection can be attempted again on the other side of the ruptured cyst wall for complete removal. In this case, a knife, rather than small scissors, is suitable for a precise procedure. If dissection is not available on the other side either, the remaining tissues and expected regions should be removed at once together with some of fat layer tissues, and suspected remnants can be removed with a curette. 1. Mehrabi D, Leonhardt JM, Brodell RT. Removal of keratinous and pilar cysts with the punch incision technique: analysis of surgical outcomes. Dermatol Surg 2002;28:673-7. 2. Zuber TJ. Minimal excision technique for epidermoid(sebaceous) cysts. Am Fam Physician 2002;65:1409-12, 17-8, 20. 3. Diven DG, Dozier SE, Meyer DJ, et al. Bacteriology of inflamed and uninflamed epidermal inclusion cysts. Arch Dermatol 1998;134:49-51. 4. Lee HE, Yang CH, Chen CH, et al. Comparison of the surgical outcomes of punch incision and elliptical excision in treating epidermal inclusion cysts: a prospective, randomized study. Dermatol Surg 2006;32:520-5. 5. Marks J, Miller J, editors. Lookingbill and Marks’ Principles of Dermatology 3rd ed: Saunders; 2006.